Fig. 1 Number concentrations of particles larger than 0.3?m in diameter with OPC KC01E. Size distributions of aerosol particles and cloud droplets, concentrations of cloud condensation nuclei, and ion were measured continuously at the summit of Mt. Fuji from 14 July to 21 August 2016. Size distributions of aerosol particles larger than 0.3?m were measured with an optical particle counter (OPC, KC01E) at the second floor of first building (Fig. 1). 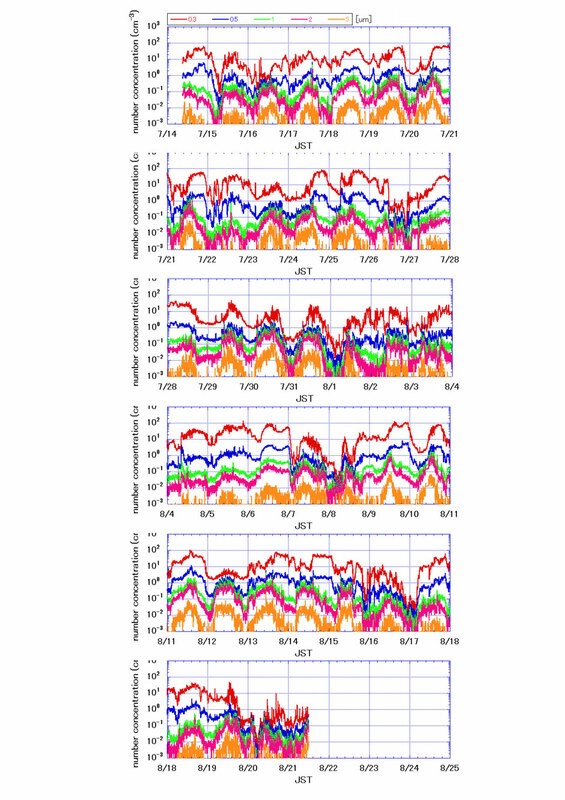 Size distributions of aerosol particles, concentrations of radon and ion, and sky radiometer were measured from last fall continuously at Tarobo, the foot of Mt. Fuji. Lidar observations were also performed at Tarobo from 8 July to 25 August by Dr. Yabuki, Kyoto University. And Sonde observations at night were performed at Tarobo from 31 July to 3 August.